The Den at Culross in Culross, near Dunfermline, Fife sleeps 4 people. The Den at Culross near Dunfermline is a detached holiday cottage with a summerhouse and your own private hot tub - the perfect spot for family and friends to spend time together. 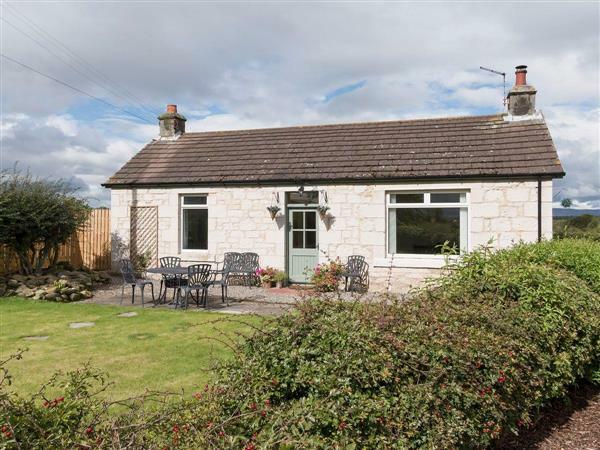 The Den at Culross is situated on a working farm, accessed by a farm track, in a quiet and peaceful location in Fife, with spectacular views over the surrounding countryside to the hills and mountains beyond. All on one level, the property boasts a well-equipped kitchen with state of the art appliances. There is also a very comfortable living room with a wood burner, comfortable furnishings and views of the garden. The enclosed outside area is private and quiet, and the front garden has a lawn which provides a great place for children to play in, or you can catch the morning sun and have breakfast al fresco. Furry friends are welcome too, and if you would like to leave the dog while you go off exploring for the day, an outdoor kennel with a run is in the garden and a hutch is also available for other little friends. Perfect for guests who enjoy a walking or cycling holiday, there are many established bridle paths, footpaths and cycle paths in the area. A selection of paths can be found on the doorstep, the owner’s land leads to the ancient Balgownie Wood, giving you access to the Fife Coastal Path and the conservation village of Culross, with cobbled lanes, red pantiles roofs and painted houses dating back to medieval times. The village has also been the filming location for the epic TV series ’Outlander’ and was transformed to the fictional village of ’Cranesmuir’. Devilla Forest is a great place for a walk or cycle, with standing stones and lots of local wildlife to spot. Exploring the area could not be easier, with major road networks within easy reach giving access to Edinburgh, Glasgow, Stirling, Perth and St Andrews, which are all under an hour by car or by rail. The beach is 5 miles from Culross near Dunfermline. With the shop 1¼ mile, and the pub & restaurant are 1 mile from Culross. Culross near Dunfermline are all on the ground floor. Living room: With wood burner, 40 Freeview Smart TV, DVD player, iPod dock and wooden floor. Kitchen/dining/sun room: With electric cooker, microwave, fridge/freezer, dishwasher, washer/dryer and tiled floor. Bedroom 2: With zip and link twin beds (can be super king-size bed on request). Gas central heating, electricity, bed linen, towels, Wi-Fi and logs for wood burner included. Travel cot and highchair available on request. Welcome pack. Lawned front garden. Enclosed rear courtyard with summerhouse, garden furniture and barbecue. Hot tub for 5 (private). Kennel, run and guinea pig hutch available. Bike store. Private parking for 2 cars. No smoking. Please note: There is a step up to the hot tub and summerhouse. Holidays at The Den at Culross run from Friday to Friday. Pets allowed at The Den at Culross. For a better idea of where The Den at Culross is, you can see The Den at Culross on the map below. The Den at Culross is in Fife; should you be on the lookout for a special offer, you can find all the special offers in Fife. It's always worth checking to see what is on offer at the moment. Do you want to holiday near The Den at Culross (UKC2130), you can see other cottages within 25 miles of The Den at Culross; have a look to find your perfect holiday location.